“First, I want to greet you all. As I often tease my Indian friends, although I’m physically Tibetan, my mind may be more Indian than yours. You may not appreciate the ancient Indian knowledge in which I have trained. In ancient India practices for cultivating a calmly abiding mind and insight (shamatha and vipashyana) were pursued before the Buddha appeared. These practices continue to be relevant today. “Today, we face many problems to which we have contributed. We place too much emphasis on secondary differences like nationality, religious faith and race, when fundamentally we are all the same as human beings. We are born the same way. We are nurtured by our mothers in the same way. But because of the materialistic goals of our education systems we don’t pay much attention to inner values. What we need to remember is that at a deeper level we are all the same. We all want to be happy not miserable. Since we can help our fellow human beings and can communicate with them, this is what I have dedicated my life to doing. “As a Buddhist I admire the way different religious traditions live together in this country and I promote inter-religious harmony wherever I can, inspired by India’s example. His Holiness answered a question about Indian foreign policy towards China by repeating what he told journalists during the Doklam crisis. Economically and in terms of the size of their populations both India and China are important. Neither can destroy the other. They have to live together. Asked how the issues of Kashmir and Tibet are different His Holiness quoted Foreign Minister MC Chagla’s telling him they were totally different. He observed that India today is a union of different states with different languages, written scripts and cultures that choose to live together. He recalled Vinoba Bhave’s idea for a South Asian union and speculated that if such a farsighted plan had been fulfilled it might have meant greater peace in the region. He reiterated his admiration for the European Union which has ensured peace in Europe for 70 years. With reference to Tibet His Holiness reported Narasimha Rao’s telling him that India regarded Tibet as an autonomous region of the People’s Republic of China, rather than as a ‘part of China’. He noted that Chinese documents record that in the 7th, 8th and 9th centuries Mongolia, China and Tibet were independent empires. He added that historically the Great Wall marked the Chinese border and that Manchuria, Mongolia and Tibet were beyond it. In the 20th century China distinguished between Inner and Outer Tibet, regarding Inner Tibet, including His Holiness’s birth place in Amdo, as within China. As to why the issue of Tibet has not come up in international forums, His Holiness recalled three occasions when the question was raised at the UN. However, India’s representative abstained from the vote. Nehru, who His Holiness described as a wise man, was of the view that the Tibet question could not be settled that way and Tibetans would have to negotiate directly with the Chinese. His Holiness mentioned former Foreign Secretary Jagat S Mehta’s coming to see him in his old age and telling him that during a Cabinet meeting to discuss the Dalai Lama’s imminent arrival in India, Krishna Menon opposed his being granted asylum, while Nehru insisted he should be welcomed. 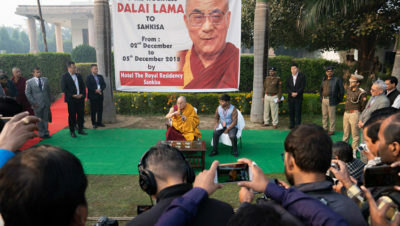 When the question of the difference between Kashmir and Tibet was repeated, His Holiness told the man who asked it that he should study Tibetan history and judge for himself. At the teaching ground the crowd had grown. Today, it was estimated to be more than 40,000, most of whom came from within a 100kms radius of Sankisa. However, there were also parties from Rajasthan, Maharashtra, Delhi, Haryana, Punjab, Madhya Pradesh, Bihar and Uttarakhand. The majority of these people consider themselves to belong to the Shakya clan to which the Buddha belonged. Also joining the throng were 400 people from 35 other countries. The session again commenced with school-children reciting the Mangala Sutta in Pali, following which His Holiness recited several verses of salutation as is his custom. This is the teaching of the Buddha. “The key is completely taming your mind. If you have peace of mind, you’ll do no harm to others. Whatever problems you face it’s better to meet them with peace of mind. ‘Guide to the Bodhisattva’s Way of Life’ contains important advice on how to achieve this. “I received a reading transmission and an explanation of this book in 1967 from the Kinnauri master, Khunu Lama Rinpoché. He requested me to teach it frequently. Consequently, I read it, I teach it and I carry it with me wherever I go. I have a similar relationship with Nagarjuna’s ‘Fundamental Wisdom of the Middle Way’. These are two of the most important Indian treatises translated into Tibetan. Reaching the verse that states: ‘In brief, the awakening mind should be understood to be of two types—the mind that aspires to awaken and the mind that ventures to do so,’ His Holiness announced that he had thought of holding a ceremony to generate the aspiring awakening mind and take the bodhisattva vows. He mentioned that he uses a common verse to do this himself every day. Until enlightenment I turn for refuge. May I attain enlightenment for the good of all beings. May gods, demi-gods and all be joyful.